Don’t trade in your copy of Dishonored just yet – more story DLC is on the way. The first-person stealth title was one of the most delightful and surprising games to release last year. Dishonored implemented some truly interesting gameplay elements set in a unique universe. That universe expanded with The Knife of Dunwall DLC, which dropped in April and set you in the shoes of Daud, one of game’s primary antagonists. Now, Bethesda and Arkane Studios are prepping more story content for the game, and the official Dishonored Twitter account has the first concept art from the upcoming Brigmore Witches DLC. 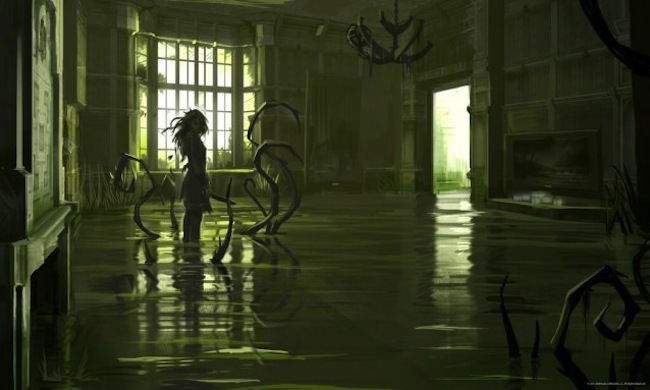 In Dishonored lore, the Brigmore Witches are a coven of powerful black magic practitioners who reside in the city of Dunwall and are antagonistic with the Whalers. The image comes with the message “Daud’s journey concludes” and the promise of more information tomorrow. Brigmore Witches will be playable at QuakeCon 2013 in August. Dishonored fans, are you excited to get your hands on one last bit of DLC? Let us know in the comments.